To be honest, I had no idea who Moris Tepper was either. He's backed up Tom Waits. He's backed up Frank Black. He's backed up Robyn Hitchcock. He's backed up Captain Beefheart. And since 1996 he's issued three solo records on independent label Candlebone Records. He's a guitarist. And he's a bit noisy. A bit of a deconstructionist. He's blues. He's folk. He's a singer/songwriter. Mostly, he's noisy. At 7pm sharp Tepper walked onto an empty stage carrying an acoustic guitar. Tepper is in his mid forties, and he looks and sounds every bit the twenty-year music veteran. Specifically, although his voice has some range, it's always low and raspy. It's easy to detect a multitude of musical personalities in Tepper's vocal stylings. At the noisy, rambling worst, he's a very poor man's Tom Waits. In his clearest, most focused material, he recalls the pop genius of Chris Bell. In between those extremes Tepper finds his own space. 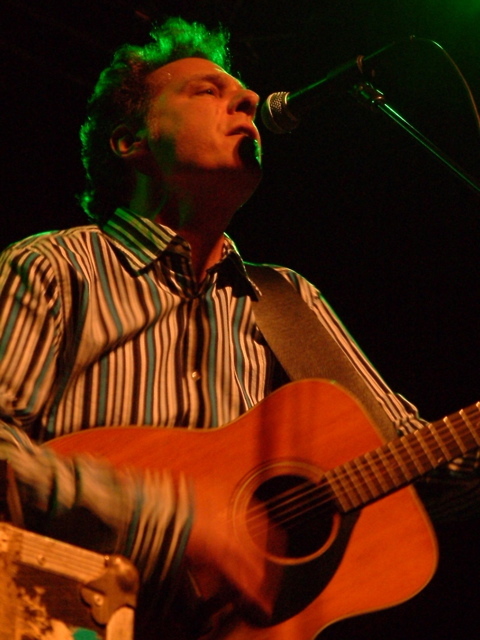 Even when performing with only his acoustic guitar, Tepper hardly conjures the image of a singer/songwriter. You'll find no cleanly strummed open chords, but rather distorted, disjointed jumps. And while his guitar is distorted, his vocals are more so – often to the point of unintelligibility. When he wishes to add to the cacophony, he simply trades his acoustic guitar in for a noisier Telecaster. These moments of chaos recall Tepper's work with Beefheart the most. While he never fully returned to that psychedelic-tinged art rock (it would be hard to replicate those complexities in a solo setting), he was able to stupefy PJ Harvey's more conservative audience all the same. And as if to simply prove he can turn it up to 11, Tepper played several songs along with a sequenced stomping rhythm track. In these songs he would break his nonsensical rhyming lyrics with accents created by haphazardly blowing into a harmonica. Although certainly avant-garde, Tepper's performance remains somehow grounded. He's building and destroying simultaneously, and his take on folk and blues is both timeless and exciting. That isn't to say that there aren't tedious moments, explorations gone too far, or elements that simply don't work; however Tepper seems perfectly content in making those mistakes, subscribing to the adage that innovation is often born from should-have-been disasters. Tepper greeted the audience with congratulations for the Red Sox. Although praising the home team is always good for cheap applause, his repeated Sox references eventually told me Tepper was after more than ego-feeding hoots and applause. Much like two strangers attempting to make a connection in an elevator based on conversations about local sports or the weather, Tepper thought he could use the Sox to break the ice between his own difficult music and an audience that had never heard of him. Honestly, I have no idea if it worked -- this audience was completely foreign to me. While I may venture out several times a week for shows, and have done so for 15 years now, I'm not at many shows like this. I'm not used to shows where people dress up to go out. Where people buy their tickets at Ticketmaster. Where the audience is separated from a band by a barricade and bouncers. Where no cameras are allowed. Where the headlining performer has posed on the cover of Rolling Stone. Where the audience must hoot each time a roadie or tech, much less the performer, approaches a microphone. These are fans. I'm much more accustomed to the passive, if not indifferent, attendees I see at indie rock shows. I have no idea if these fans – the ones that were shouting for other fans to sit down so they themselves could remain seated, sip their drinks, and watch the show – ultimately made a connection with Tepper. Tepper must have thought so. Just before leaving the stage he smiled joyfully and stated proudly and incredulously, "Somehow Boston gets it." Every day for the past week I've written and re-written my thoughts on the PJ Harvey experience. I'll confess up front that I'm not a fan. While, in theory, I like PJ Harvey – the bold opinions, bravely addressing the taboo subjects, her admitted frailties and demonstrated strengths, the unsettling musical approach – the actualization has never spoken to me. So instead of writing about set lists, and how songs might have been played live, I stuck to other topics like the odd fixation with fashion that Harvey and her mimicking fans share, or Harvey's post-feminist (not my words) lyrical statements. But in the end, it all seemed fake and pointless. Furthermore, I sat in the balcony at the back of the club. I couldn't see if the tiny gal on stage wearing a bright yellow sundress was Polly Jean Harvey or if it was Gina Gershon. So if I were to comment on her performance, it would be complete guesswork. Additionally, Harvey provided no clues to her mood; the entire night she only spoke the words "thank you," and those didn't come until after the fourth song. Likewise, the moods, attitudes, and even identities of her backing band were completely unknown to me. How people write about big shows is beyond me. Unless you can see if a performer is smiling or sweating or wincing or bleeding, how can you write about a show? I'm left only being able to comment on crowds, and lights, and sound production, and that doesn’t interest anyone. So PJ Harvey played. The band played songs fans recognized, though it didn't play the two songs I knew. After accepting flowers from the audience (it was Harvey's birthday), the band left the stage, returned for a four-song encore, and then left again. 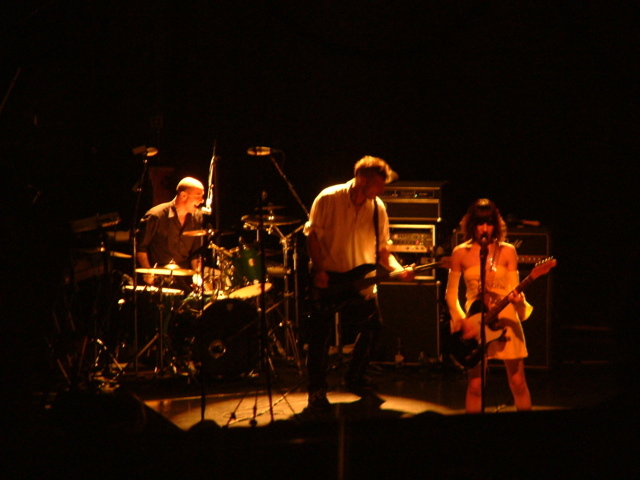 The set list revealed the band had planned on a second encore, but whether it was dismissed by the band for some reason or dropped due to the club's time constraints is unknown. I guess that's where the show ended. Dana and I bounded down the balcony stairs, around a crowded corner and into a sea of snails. They were, I must concede, fashionably dressed snails, but slow moving all the same. After inadvertently sharing sweat with still excited, panting strangers – each recounting the show in details I could never achieve – I made my way out to the cool, quiet night air.